Editor's Note: Oops! I just realized I never announced the winner of Flattering50's last Giveaway. Kathleen O. was the winner of a pair of Coldwater Creek jeans of her choice. She choose the knit jeans. Congratulations Kathleen! What to do about fickle fall? Two weeks ago, there was a 30+ degree drop in temperature—mid-80s F down to high-40s F. I was away at the time, doing my annual father-daughter vacation on Cape Cod. It’s bad enough trying to navigate freaky fall weather at home with my entire wardrobe at my disposal, but with only a suitcase on the Cape, I had to be creative. Those skirts and sandals I'd packed, assuming the average temps would be in the 70s F—were not going to cut it. Fortunately, I had also packed jeans. Here’s some of the ways I styled my jeans on vacation and now that I'm back at home. 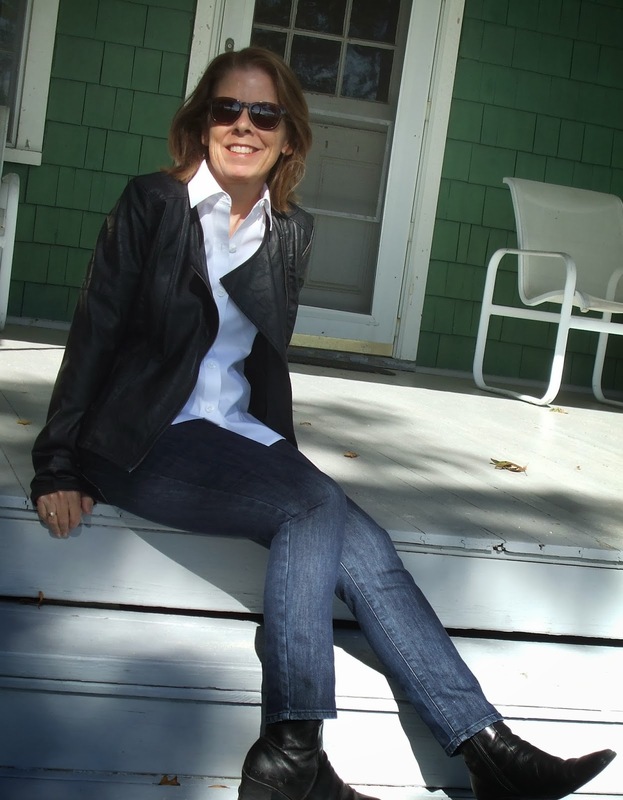 This weekend at the beach house, my husband was kind enough to snap a few photos of me in jeans. 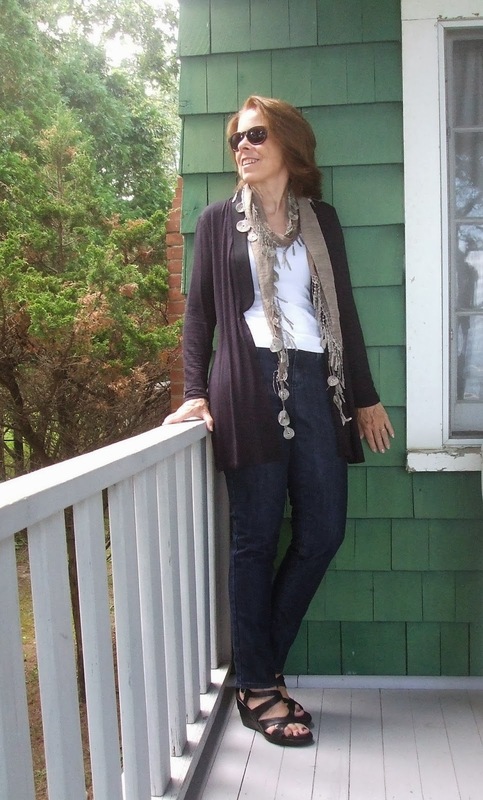 For this post, I'm wearing Coldwater Creek's slim cut jeans. Anything made of jeans materials is a great for early fall. So I say: Why not pile on the jeans! These days, I'm opting for my white jean jacket rather than my blue jean one. White is a "hot" fall color. Also, I know my mother, if she were alive, would think I was nuts to wear white now and that makes me smile (some things never change). I've left the shirt's tail out because it offers a little "bottom coverage." A little is better than none, yes? Sources: White Jean Jacket ~ Ann Taylor (old), Chambray top ~ Uniglo (new), Sandals ~ Aerosoles (old). I'm loving all the super-lightweight sweaters this fall. They offer perfect "bottom coverage" for jeans without adding bulk. Sources: Long sweater ~ Ronen Chen (new), Camisole ~ Jockey (new), Scarf ~ Local Winery (new). Biker jackets are trending big time this fall, so I plan to make the most of mine. I chose to pair it with a white collar shirt because a) I'm crazy about black and white and b) I didn't want to be mistaken for Marlon in The Wild One. In my mind, a leather jacket, nice blouse, jeans and boots are perfect for going out to dinner at a casual restaurant. Sources: Biker jacket ~ Local thrift shop, White blouse ~ Foxcroft (new), Ankle boots ~ Nine West (old). HOW ARE YOU STYLING YOUR JEANS THIS FALL?